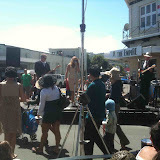 Today is the 19th annual Hutt News Rotary Fair held at Jackson Street Petone. Over 300 stalls offering everything from delicious food to an array of merchandise was on display. Huge crowd, great weather, bit blustery but fun for the family the photos and video are just a little insight into some of what happened. Click through to the photos.